Tag line: "She challenged the desert, its men, their passions and ignited a bold adventure"
In a career that spanned six decades, director Andrew V. McLaglen worked with some of Hollywood’s best and brightest, including James Stewart (Shenandoah), John Wayne (McLintock! ), and Gregory Peck (The Sea Wolves), and while he’ll never rank alongside Hitchcock, Hawks, or John Ford as one of the all-time greats, his accomplishments on both the large and small screens were, to say the least, impressive. So imagine my surprise when his name popped up in the credits for Sahara, a 1983 Cannon Films-produced adventure / romance starring Brooke Shields as a feisty American who braves the rough desert terrain to win a cross-country car race. But the shocks didn’t end there. As it turns out, Mr. McLaglen was the first in a string of talented people involved in the production of this interesting, though ultimately flat motion picture. The year is 1927. Automobile manufacturer Gordon (Steve Forrest) has built what he believes is the fastest, most durable car in the world. To prove it, he plans to take the vehicle to Africa for The Sahara World Rally, a race through the Sahara Desert that only a few brave souls dare to enter. But when Gordon is killed during a test run, his daughter Gale (Shields), who is herself an experienced driver, takes his place, and, along with chief mechanics String (Cliff Potts) and Andy (Perry Lang), she joins fellow drivers Von Glessing (Horst Buchholz), Bertocelli (Tuvia Tavi), and Brown (Terrence Hardiman) at the starting line, kicking off what she hopes will be a thrilling adventure in the heart of North Africa. Ignoring the advice of the French military attaché, who urged the drivers to follow the long route around the desert, Gale decides to take the shorter route, which, though quicker, cuts through an area that is being ravaged by a brutal tribal war. Sure enough, their 2nd day out, the naïve young woman and her mechanics are captured by Rasoul (John Rhys-Davies), whose nephew is Sheikh Jaffar (Lambert Wilson), ruler of one of the tribes. The moment he sets eyes on Gale, the handsome Jaffar falls madly in love with her, and vows to one day make her his bride. But Gale wasn’t the only one who took the shortcut; Von Glessing was right behind her. While the treacherous German does hope to eventually win the race, Von Glessing’s main goal is to sell a new weapon to Jaffar’s enemy, Sheikh Beg (Ronald Lacey), one that could help him defeat Jaffar’s forces on the battlefield. Will Gale get a chance to finish the race, or is she destined to become a pawn in a bloody war? Though not considered a strong actress at this point in her career, Brooke Shields does an admirable job as Dale, and her scenes with Lambert Wilson’s Sheikh are, at times, quite passionate. But it’s the supporting cast of Sahara that truly impressed me; along with Horst Buchholz (The Magnificent Seven) and John Rhys-Davies (Raiders of the Lost Ark), the movie features Sir John Mills (Great Expectations) as Cambridge, a British valet working for Jaffar. In addition, the musical score was composed by none other than Ennio Morricone, and the various production and costume designers did a great job recreating the time period of the 1920’s (especially during the early scenes set in Detroit). 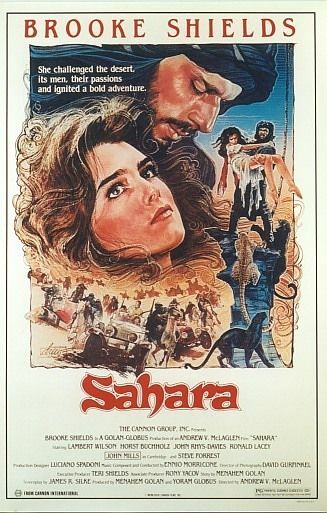 Alas, Sahara, which was based on an original story by Cannon’s Menahem Golan, never lives up to its potential. In fact, there are stretches when the film is downright boring (the racing scenes are few and far between, as are the battle sequences). I give the folks at Cannon a lot of credit: they assembled a top-notch cast and turned out a very pretty movie (some of the desert shots are breathtaking). If they had thrown a bit more excitement into the mix as well, Sahara might have actually worked.